Tagged under Yuki Urushibara, Artland, Series. Imagine that there are creatures that are neither vegetables nor animals, but they are the very essence of the life living around us. Imagine that not everyone can see them, but they can influence your life in the strangest manner. They are called "mushi". 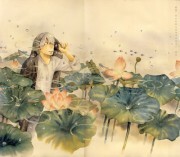 Ginko is a "mushishi"; a mushi hunter. Follow him as he wanders across the land, studying, healing, and teaching, trying to help normal people to live in harmony with mushi. Mushi-shi is a pretty simple series but it can also be complex, how Ginko deals with Mushi is interesting and enjoyable. The story was thought through I imagine since the story was so amazing. Since every episode begins and ends you are capable of going back to any episode you found was most intriguing and Rewatch it once again. Plus you can't go wrong with an anime that has won several awards can you? In my opinion I believe that Mushi-shi should be watched in English it may sound strange but it seems like the English voice actors fit the characters more than the Japanese voice actors but of course that is only my opinion. I find it more suitable for an audience with a more mature state of mind. Directed by Hiroshi Nagahama, Art design Yoshihilo Umakoshi, Original Manga by Yuki Urushibara. Mushishi is one of those anime that come along and stun people. I would truly call this anime a work of art. The art in the anime is sublime, of such excellence, grandeur, or beauty as to inspire great admiration or awe. You can’t help but just pause a frame just to admire the scenery that is depicted. Most of the stories are in mountains areas or on the coastline, which makes sense since it’s setting is on Japan. The protagonist of the story is Ginko, a traveling medical man of sorts, is laid back, smart and caring. He wonders around Japan collecting objects and characteristics of things called mushi. Mushi are an invisible bug like spirit. Most people cannot see them, Ginko is one of the few who can see them. This mushi can be mysterious, deadly, or mundane. Every episode has a different story of Ginko helping someone involved with mushi. One of my favorite episodes is one where him and another traveler are searching for a mushi that lives in a rainbow. Every episode has its own unique atmosphere that always was strong mysterious emotions. What adds to the atmosphere is the music composition. Toshio Masuda does a great job on composing the music to fit the otherworldly atmosphere of the show. I recommend this anime to anyone who has a little interest in anime at all. This is absolutely beautiful. Anime and manga. I think manga pulls off the beauty a little better but still. If you don't like storylines with little drama, action, or romance. Then this might not be for you. I think the right way of describing it is tranquil. Remind me of Mononoke with main protagonist fighting spirits (both Ginko and medicine seller are cool too^_^) and Natsume Yuujinchou with spitit theme and overall climate. Both are light, relaxing, but sad and deep sometimes. You watching every next episode with a curiosity what the story will be about and what role our Ginko will play in it. 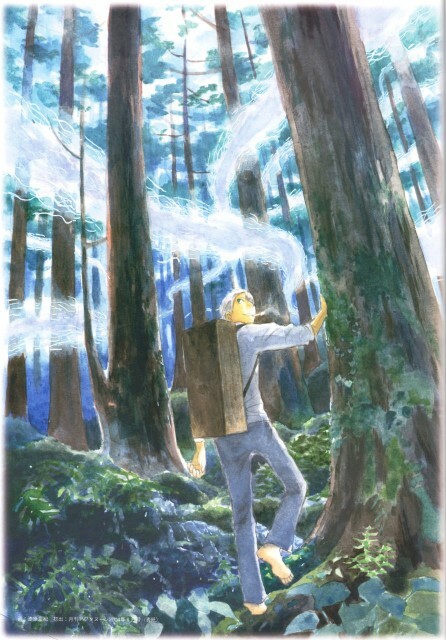 What is really amazing about Mushishi are sceneries and landscapes. Mysterious and beautiful. interesting view of world. main character has a touch of mysterious. in fact, all about him remained a mystery even after the anime ended. the bit about his past is fascinating. the work he does for a living fascinating. the special relationship he shares with the female recorder a sweet touch. the great friendship he developed with the doctor one of the entertaining moments. the whole concept of the spiritual world that shape our entire planet earth is fascinating. never seen similar before nor since. While this series is kind of episodic, that's part of the beauty of it! Gorgeous artwork and interesting storylines make for one refreshing anime. However, the secondary characters have a tendency to resemble each other. One of those series that doesn't necessarily need to be seen in order. I must say that Mushishi is the type of anime I like most. Kinda filosofical and mysterious, about the folklore and such a stuff. It is anime that is hard to forget and makes you think about lots of stuff. Beautiful. That's Mushishi in a word. It's a quiet series, so don't expect battles and lengthy character development. The protagonist (along with a doctor friend and a person who pops in for one episode then narrates some opening sequences~ XD ) is the only character you really see for more than one episode, and he's an understated man, better suited to floating about helping others then forming intricate social webs. If you're looking for romance or something with strong friendships and character rivalries, Mushishi isn't your best bet. Not to say that people don't relate with one another--they do. It's just that the protagonist is the one helping others relate, not the one doing the relating himself. Eh, anyway, it's beautiful. Give it a watch. I have seen about two thirds of the anime, the only reason I haven't seen all of it is that I don't wish to rush! The animation and scenery is beautiful. I like the fact that while the episodes are always resolved in some way, it isn't necessarily a happy ending. A wonderful unique spiritually touched anime. It shows us the beauty of nature and unfolds his story slowly like a blossom of a flower. It is truly a piece of art with mesmerizing sound. The essence of the anime is so unique from all the rest. It incorporates scientific theology with fantasy mixed in one beatutifully drawn anime. The anime isn't a whole story, but a series of adventures that focus on Ginko, the mysterious mushi master. When I first watched it, I was very intrigued by the complexity of the stories. The artwork is simply out of this work. I could not believe that each of the scenic backgrounds were developed by the mangaka himself. Definitely something you should not miss out on.